Upon arriving these young guys announced they were on "Team Worm." 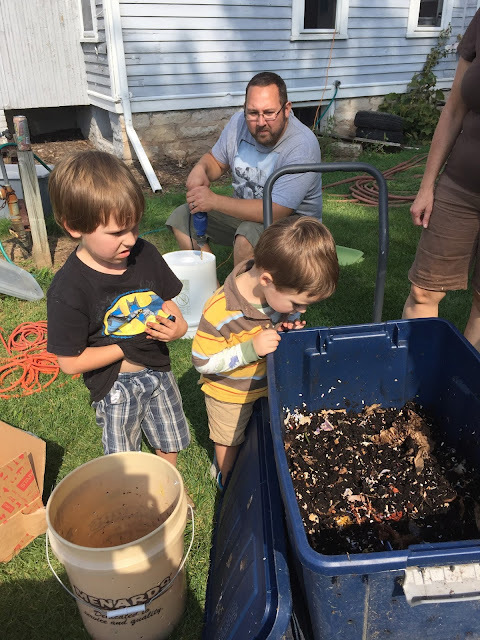 We had great weather and a nice turnout for the Worm Bin workshop two weeks ago. 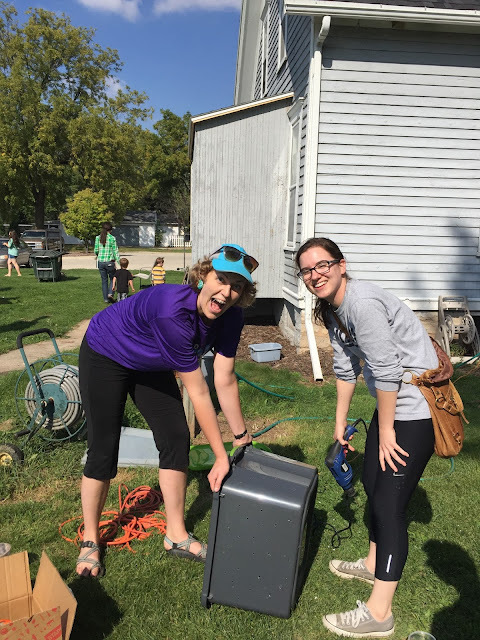 I talked about the basics of home-scale worm bins and we worked to drill holes in bins and get people set up with ample starter worms and bedding. I passed out this PDF on worms and recommended Mary Appelhof's excellent book Worms Eat My Garbage. A nice benefit of giving away so many handfuls of worms for the starter bins is that our home bin is now light enough to move into the basement for the winter. Anna and Alaina getting pumped for vermicompost. On the subject of moving the bins in for the winter: I'm planning to build a new wider, double-stacked model to contain the rich liquid that drains through the bin. Last year I propped the bins up on 2x4s on top of plastic garbage bags. While that set up probably mitigated the mess (slightly) it did little to stem the flow of the rich vermicompost liquid. This year I hope the bottom bin will not only prevent the same dark mess, but will yield a highly concentrated liquid I can add to plants in spring. We shall see. In fact, there's a lot of room for (and not much risk involved in) experimentation in home vermicomposting. My efforts pale in comparison to those Bentley Christie, self described Compost Guy and energetic cheerleader for worms, vermicompost, and home experiments. If you're growing excited about these things, I recommend his website Red Worm Composting where he describes with great enthusiasm (and ample puns) various methods and techniques. Onward, upward, and on into the coming winter. Next up in my Land Scouting: saving seeds before first frost and documenting the fruit trees in our neighborhood.